When the unexpected happens and unplanned financial expenses occur, do you have the funds at call ready to cover them or are you someone who uses credit to bail yourself out? Whilst it may be tempting to rely on your credit card to cover unplanned expenses, unless you are good at managing the repayments in full and on time, these expenses can often end up costing you more than you may anticipate due to high interest rates and penalties. An alternative strategy is to proactively prepare for surprise financial expenses by setting up an emergency fund or cash reserve. Personal preference on how much you would need to feel comfortable if you had no income coming in. What is your tolerance for risk? The less you have saved, the more risk you take. The stability of your income. If your income fluctuates or is variable, you may need to consider a larger buffer to cover you for a longer period. Whether you have insurance covering your income, house, car, health and other assets, this may help to lessen the need for a large reserve. However, remember that you may need to cover any excess for the claim and fund shortfalls that aren’t covered by the insurance. If you have large levels of debt. When you have debts it can be comforting to know that you have a few month’s repayments up your sleeve in the event the unplanned occurs. Leave entitlements at work – if you’ve accumulated sick, annual and long service leave entitlements, this may be useful in the event you need to take time off work due to sickness or accident. When setting up an emergency fund, it can often pay to keep the funds aside in a separate account, that way you are keeping them away from your everyday spending account and will be less tempted to dip into these funds for other purchases or spending! Also remember that the account you choose should be fairly liquid, which means that the funds are generally best kept “at call” allowing access if required, even at short notice. 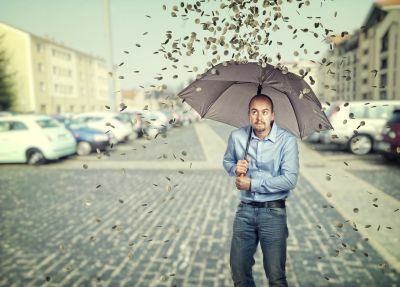 Unfortunately a financial rainy day can happen, but the good news is that we can prepare ourselves and lessen the surprise or financial burden by being proactive and setting aside funds to help cope with these costs when they arise.